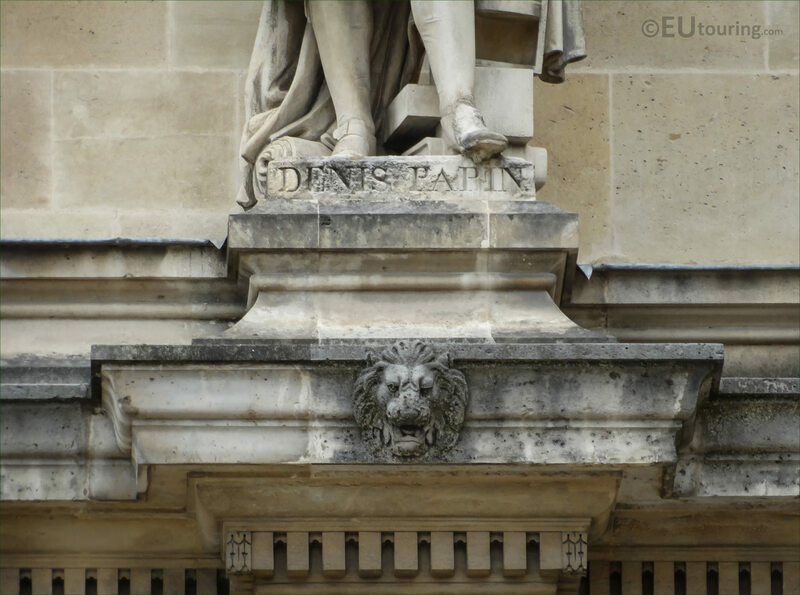 There are so many different statues on The Louvre to discover, and while we were still within the Cour Napoleon heading towards the enclosed area passed Pavillon Colbert you will come across a facade that was named the Rotonde de Beauvais, and these following HD photos show the 1857 Denis Papin statue on this part of the building. 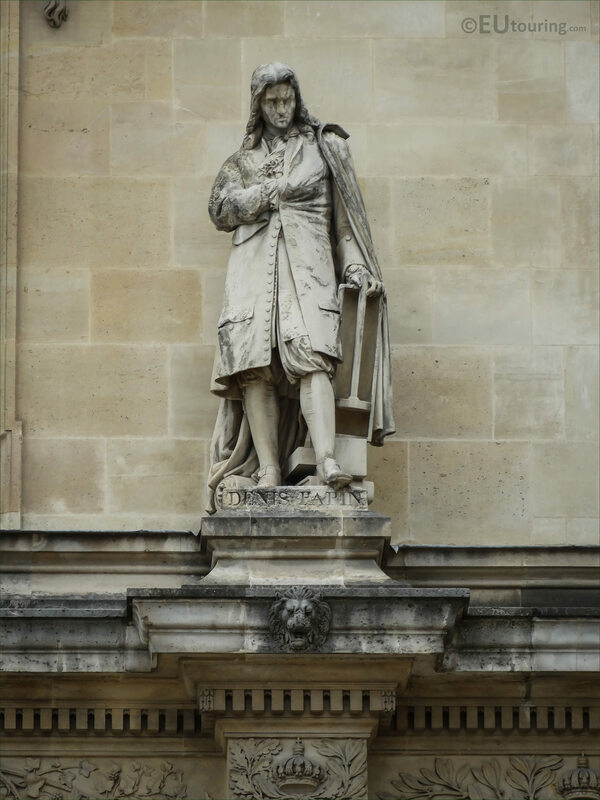 Now, as we mentioned, this HD photo shows one of the statues on the Beauvais Rotunda, which is dedicated to a person called Denis Papin, and this was sculpted in 1857 by the French sculptor Jean Francois Soitoux, which can be discovered on the first level of statues, second from the left as you are looking at the facade from the Cour Napoleon. 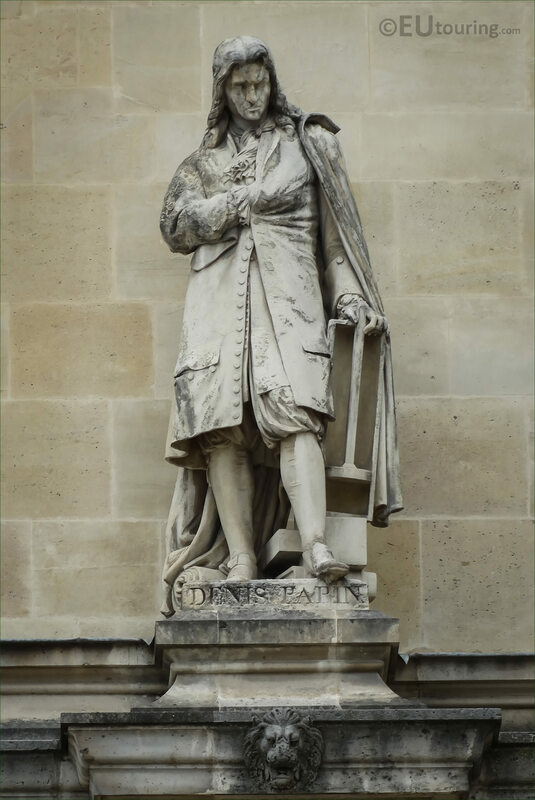 This close up photograph showing the base of the statue with the inscription of Denis Papin, that the statue is dedicated to, and he was a was a French physicist, mathematician and inventor, born in 1647 and is most well known for his pioneering invention of the steam digester, which was the forerunner of the steam engine and the pressure cooker, yet he is presumed to have died destitute and buried in a paupers grave around 1712. 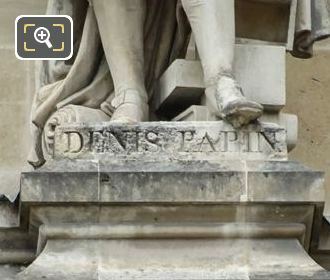 And in this last image showing the statue of Denis Papin, as we mentioned earlier, this was produced by the French sculptor Jean Francois Soitoux, who was born in 1816 in Besancon and passed away in Paris in 1892, and during his career he received several commissions for the Palais du Louvre, plus he was awarded the Legion of Honour in 1866.